Here’s a nice close up of my drawer sides with the tails cut. The small gap between the boards is the rabbet I cut to help line up sides and front. Its a trick I learned from Chris Schwarz. Next I’ll use the fret saw to clean out the waste and trim up with a chisel. 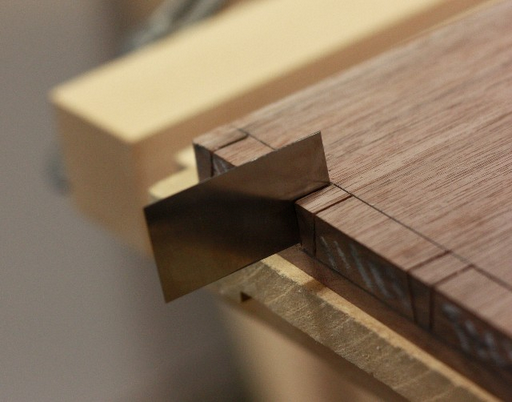 I’m cutting half blind dovetails into the walnut drawer fronts. Here’s a trick I learned .. from some where. When cutting the half blind socket, the saw doesn’t cut the entire socket. If you sharpen the edge of a scraper and then hammer it into the saw kerf, it cuts the socket full length and .. in theory makes it easier to clean out. This entry was posted in dovetail, drawer, tip, tool cabinet. Bookmark the permalink. 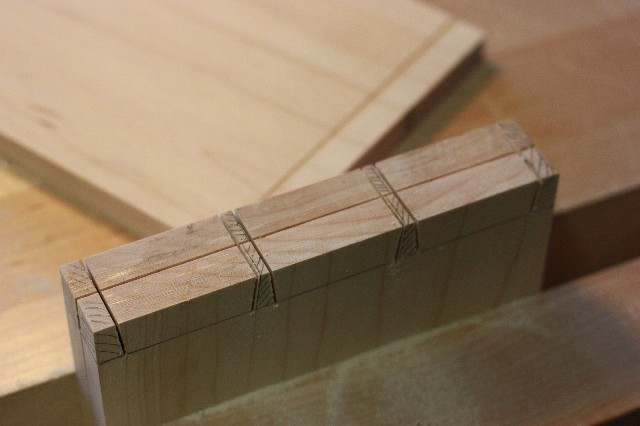 I used a similar trick on my toolbox tote dovetails for the first time, and it worked great! I recently acquired the Veritas moving fillister plane and used it for this. Night and day difference on layout. I think the card scraper trick is one I saw in a book by Tage Frid. I remember seeing the scraper trick somewhere too. I watched a Rob Cosman video were he demo'd half-blinds and he uses the sawn surface on the side of the joint to register his chisel for paring. I think I need to buy another plane to do the rabbit trick. Talk about mixed blessings. Found the video that gave me this idea, its two part:Tips for Cutting Halfblind Dovetails Part 1, with Tim Rousseau – http://www.youtube.com/watch?v=pAlIM0dzrUgAnd, of course, the pin board needs to sit on a solid surface so you don't split it. I've used light taps and so far haven't split yet. The biggest problem I've had is getting the small scrapper back out. Don't remember having that problem with the bigger scraper. If that works out well it would be cool to make a tool just for this operation. It would be sharpened on one edge – single bevel – like a marking knife. Maybe a brass back to spread the hammer blow and a nice (longish) wooden handle so you could keep your hands out of the way.Of course you'd need a left and a right version.